GKIDS, the acclaimed producer and distributor of animation for adult and family audiences, and Fathom Events are proud to announce the U.S. national debut of Studio Ponoc's animated anthology "Modest Heroes: Ponoc Short Films Theatre, Volume 1." This feature-length collection of three short films is the latest project from Studio Ponoc, the new Japanese animation studio founded by two-time Academy Award®-nominee Yoshiaki Nishimura (The Tale of The Princess Kaguya, When Marnie Was There) and featuring many artists from the venerable Studio Ghibli. "Modest Heroes" is the studio's follow-up to last year's critically acclaimed animated feature Mary and The Witch's Flower, which was also presented in cinemas by Fathom Events and GKIDS. In addition to screening the anthology, attendees will view behind-the-scenes exclusive content on the making of "Modest Heroes." Tickets for "Modest Heroes" are available now at www.FathomEvents.com, www.ModestHeroesFilm.com and at participating box offices. 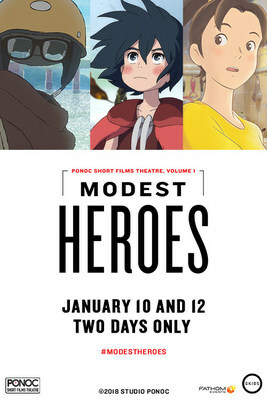 "Modest Heroes" comes to more than 400 U.S. cinemas on Thursday, January 10 at 7 p.m. local time (in English) and Saturday, January 12 at 12:55 p.m. local time (in Japanese with English subtitles). For a complete list of theater locations, visit the Fathom Events website (theaters and participants are subject to change). "Modest Heroes," is an ambitious collection of three thrilling tales created by some of the greatest talents working in Japanese animation today. There are three stories in the anthology: Kanini & Kanino, Life Ain't Gonna Lose and Invisible. Kanini & Kanino is directed by Academy Award®-nominee Hiromasa Yonebayashi (When Marnie Was There, Mary and The Witch's Flower); Life Ain't Gonna Lose, featuring the voice of Maggie Q (Nikita, Designated Survivor), is helmed by Yoshiyuki Momose, who was a key animator on Isao Takahata's films at Studio Ghibli; and Invisible director Akihiko Yamashita was a key animator on many of Studio Ghibli and Hayao Miyazaki's best-known films. Each is produced by Studio Ponoc's Nishimura. Together, the stories explore ideas of heroism large and small, and the infinite potential of the short film format allows the directors and Studio Ponoc to experiment with breathtaking, action-packed visuals, concise human drama and gorgeous fantasy worlds, in an unforgettable anthology that is further demonstration of the studio's exciting future. In Kanini & Kanino, directed by Academy Award®-nominee Hiromasa Yonebayashi (When Marnie Was There, Mary and The Witch's Flower), two crab brothers embark on a grand underwater adventure to find their father, after an accident carries him far downstream. Depicted as tiny beings in a large and merciless natural world, the brothers must evade a series of freshwater predators if they are ever to reunite with their family again. In Life Ain't Gonna Lose, acclaimed animator Yoshiyuki Momose (key animator on Isao Takahata's films at Studio Ghibli, and animation director of the video game "Ni No Kuni") makes his directorial debut with a very different kind of story. Eight-year-old Shun loves baseball and to run. Only eggs defeat him. With the love of his strong-willed mother (Maggie Q), Shun faces the challenge of an everyday life threatened by a deadly allergy. Lastly, in Invisible (the directing debut of Akihiko Yamashita, a talented key animator on many of Studio Ghibli and Hayao Miyazaki's best-known films) a man wakes up one morning and goes through his day in a world where no one can see him. But just when he seems to have reached his limit, a momentous decision gives him the chance to reclaim his humanity. "Along with our friends at GKIDS, we brought some of the finest and best-loved Japanese animation to American shores in 2018," Fathom Events CEO Ray Nutt said. "We are proud to once again partner with GKIDS to kick off 2019 with this wonderful anthology." For artwork/photos related to "Modest Heroes," visit the Fathom Events press site. GKIDS is a producer and distributor of award-winning feature animation for both adult and family audiences. Since 2010, the company has scored an astounding ten Best Animated Feature Oscar®-nominations with The Secret of Kells in 2010, A Cat in Paris and Chico & Rita in 2012, Ernest & Celestine in 2014, The Tale of The Princess Kaguya and Song of the Sea in 2015, Boy and the World and When Marnie Was There in 2016, My Life as a Zucchini in 2017, and The Breadwinner in 2018. GKIDS also handles North American distribution for the famed Studio Ghibli library of films, one of the world's most coveted animation collections with titles Spirited Away, My Neighbor Totoro, Princess Mononoke and others. GKIDS recently launched ANIMATION IS FILM, an annual LA-based film festival. ANIMATION IS FILM embraces the highest aspirations of animation as a cinematic art form and is a vocal advocate for filmmakers who push the boundaries of their work to the fullest range of expression of which the medium is capable.